As I went to bed last night I realised I knew another great thing about having children in your life. Days working in London mean leaving the house dead on six if I am to stand any chance of putting make up on in the station car park before boarding the train. 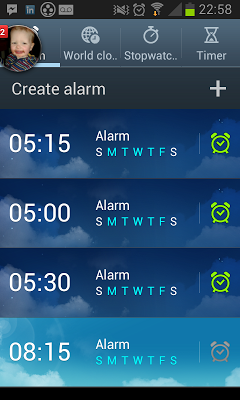 Overnights in London mean tricking myself, setting the alarm for 08:15. It's far too late, I never make it into the office for nine. But I like to think if I'm away I can have a lie in. And the best bit of being home. 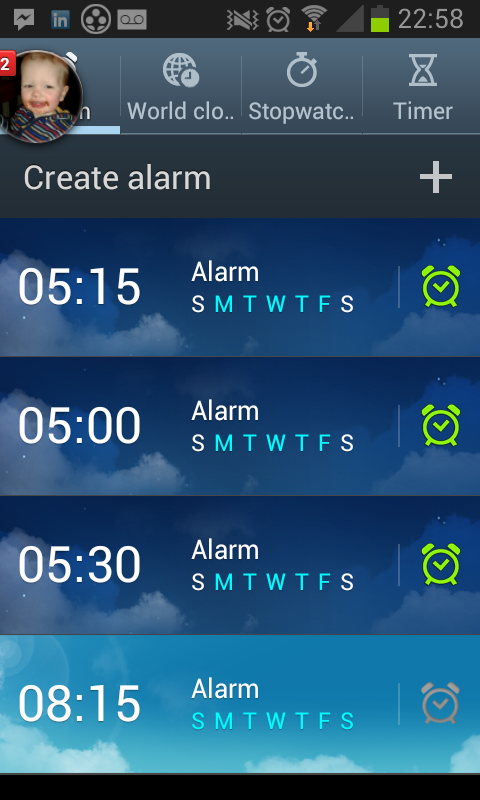 Even if I don't set my alarm I'm always in work for nine. I never sleep through the alarm. Because I don't need to set it. I wake up every morning to the sound of the boys playing, chatting or general mayhem. Thankfully we have a stairgate on the door to their room. You can't press snooze on them. Than waking up to the incessant chant of the alarm on my phone. I don't mind getting up to a happy 'good morning' from Squeaks and a 'muuuuuummmmmmmyyyyyy" from the boys. I don't want to wake up tomorrow, to play the on and off game with the alarms on my phone until I'm panicking about making the train. I can't wait for the weekend to have some morning cuddles rather than the playschool run. Your phone looks so much like my hubbies. He has several set up just for getting up on a normal day. Then e has other various ones for when he's elsewhere.